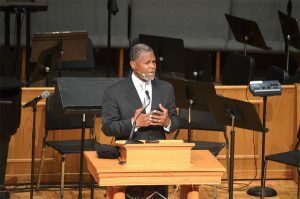 EDMOND—Five preachers brought the Word to the 2018 Pastors’ Conference at Edmond, First Nov. 12. As Walter Wilson, pastor of Lawton, Friendship, led as president of the Pastors’ Conference, racial unity was demonstrated among the speakers. Johnny Montgomery, pastor of Red Oak, First, opened the conference, making an emphasis on fervent prayer based on Acts 2:42. 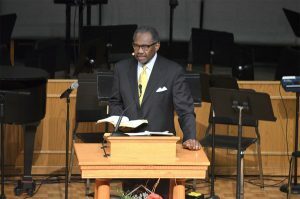 “I’ll never be the pastor that God’s called me to be unless I’m on my face, like the early church, seeking a Holy God and asking God to do the work,” Montgomery said. He also shared experiences of witnessing to members of his family as well as how God blessed Red Oak, First with new families attending and becoming members. Fountain continued speaking on the importance of influence among other believers. J.D. 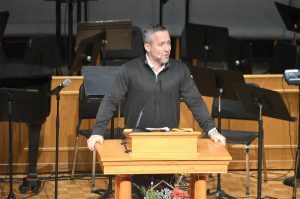 Greear, president of the Southern Baptist Convention, preached on Stephen in Acts 6, how he was an ordinary Christian who was doing extraordinary work. 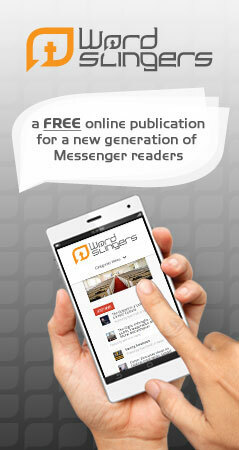 Greear offered four convictions of ordinary people for the Gospel. He said they know God wants to use them; they are filled with the Holy Spirit; they are “Jesus” to other people; they know Jesus is worth it. LeRon West of Tulsa, Gilgrease Hills, asked his wife Marlene to sing before he brought his message. Accompanied by Michael Ware, she sang “My Tribute,” and received roaring applause. Speaking from John 9, West challenged attendees to “see beyond our own blindness.” He spoke of the man born blind, whom Jesus healed, and West said sometimes God is greater than what Christians believe He is. Roc Collins, director of strategic objectives for Tennessee Baptist Convention, delivered two messages at the Pastors’ Conference. 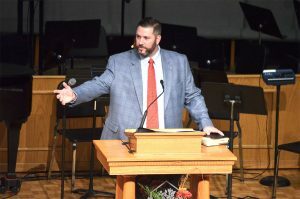 Throughout the Pastors’ Conference, video clippings were shown of Shane Hall preaching at the 2017 Southern Baptist Convention Pastors’ Conference. After a long battle with cancer, Hall, former pastor of Del City, First Southern, died in February this year. 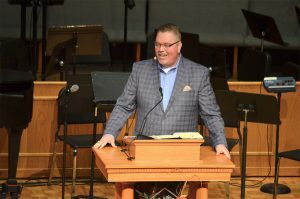 Beginning next year, the Pastors’ Conference will feature the Shane Hall Memorial Sermon, and the Shane Hall Memorial Fund was established to support the Pastors’ Conference. Elections for officers of the 2019 Pastor’s Conference were held at the conclusion of the event. Chris Fields, pastor of Clinton, First, was elected president. Nick Atyia, pastor of Seminole, First, was elected first vice president, and Chris Gordon, pastor of Hennessey, First, was elected second vice president. All three men will be responsible for selecting next year’s speakers and programming.